Valentine’s Day Treats: 3 Valentine Themed Sweet Treats! Earlier this week we shared three different tutorials and resources for making amazing Valentine’s Day crafts. Today we’ve got three recipes to share for some decadent and beautiful Valentine’s Day themed goodies. Enjoy! Valentine’s Day S’mores Cookie Sticks – This simple and adorable recipe comes from Haniela’s food blog. Who doesn’t love s’mores? And can you imagine dipping them into a cup of homemade hot chocolate? Yum! Her recipe includes homemade graham cracker cookies, but if you don’t have the time for that you could always use store bought graham crackers. Check out this recipe and some of her others while your at it. 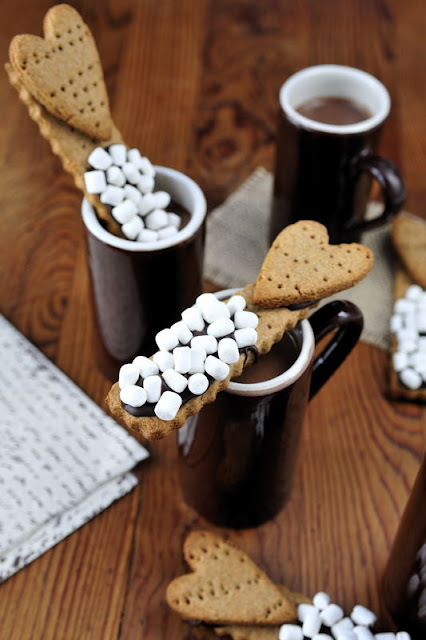 Valentine’s Day S’more Cookie Sticks – Image & Recipe by Haniela’s. Ice Cream Heart Sandwiches – If warm treats aren’t your thing you could give these cute ice cream sandwiches by 36th Avenue a try! These sandwiches are ready in just minutes, so they are perfect if you’re crunched for time. 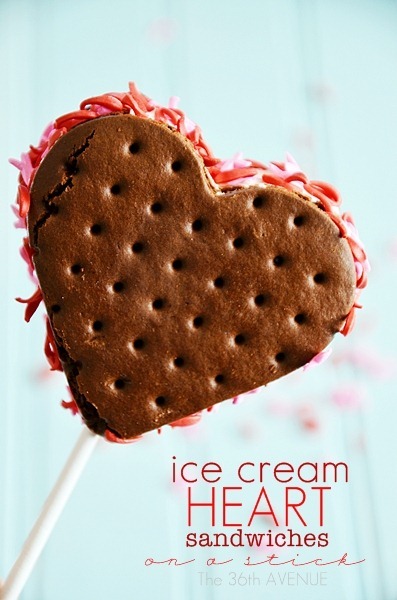 Ice Cream Heart Sandwiches – Image & Recipe by The 36th Avenue. Heart Shaped S’more Pops – So if you aren’t into dipping your s’mores than maybe you’ll enjoy eating them on a stick? This recipe and beautiful treat comes from the blog In Between Laundry. It’s a pretty easy recipe to follow, especially if you used store bought graham crackers! 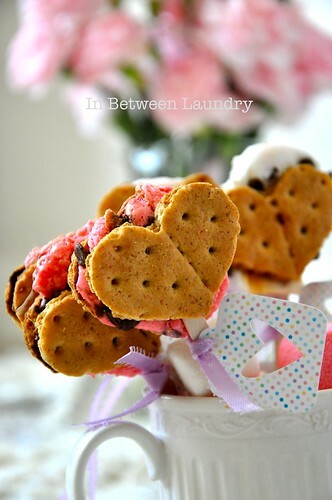 Heart Shaped S’more Pops – Image & Recipe by In Between Laundry. Do you usually bake or make anything special on Valentine’s Day?